This is the Healthy House bible revised, updated and expanded, including contributions from North America's leading building biologists. The authors - an architect, restoration consultant and medical doctor - bring a singular combination of expertise and perspectives to this book. The result - now in its third completely update edition - is a unique guide to creating healthy indoor and outdoor spaces, including many new resources as well as specialized knowledge from several nationally recognized experts in the field of building biology. "Paula is a committed and dedicated architect and one of the leaders in the green building movement. She is a pioneer, and her book is an absolute treasure of information. Paula has integrated many of the safe building practices that are time honored and tested, and incorporated them into contemporary American building practices. The dangers of conventional building materials, and how they are toxic and contribute to indoor air pollution is one of the areas of her expertise. She carefully details why standard building practices are harmful, and how to take a healthier route. Comprehensive guides on how to find some of these alternative building materials and resources are found in a Prescription for A Healthy House. This book is an absolute must for those who are considering constructing a new building, or renovating an older one. If you are interested in health, this book is a no brainer. Why wouldn't you invest a few dollars to learn what one of the most talented and knowledgeable leaders in this field has learned so you can apply it to your home? I actually hired Paula as a consultant for our new office building. With her help we were able to achieve the highest green building certification on the planet. The new building is Platinum LEED certified. There are only 17 buildings in the US, and 70 in the world that have achieved this certification level. If you are ever in the Chicago area, I hope you will stop by and visit our new office building, located at 3200 West Higgins in Hoffman Estates, IL." - Dr. Joseph Mercola, www.mercola.com, world's most visited natural health site. "Prescriptions for A Healthy House contains must-have information for those of us who wish to live safer, healthier and more sustainable lives in our new or existing home environments. The authors offer a wealth of information, resources and careful advice and specifications on a wide variety of helpful topics." "Living a truly healthy lifestyle involves more than eating well and exercising. It includes living that lifestyle in a healthy home. This revolutionary book explains why that's so important and how to make it happen. Prescriptions for A Healthy House is fascinating and practical, and gives you the life-changing, health-giving information you need in a clear, personable way. Deep bows to the authors." the longest running syndicated fitness column in the USA. "Thank you for giving me and my builder access to a healthier way of building my home. Your book has been our bible!" "The authors have combined the theoretical and practical aspects of Bau-biologieTM with the impact on health and the environment of bad building practices. 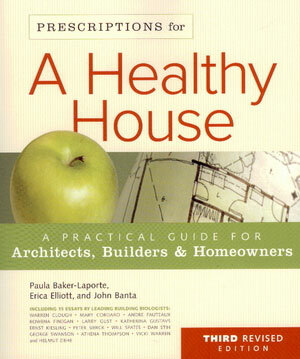 This is an essential manual for homeowners, builders and architects."